Can you explain how the exponential factor works for coins? How do you know what the factor for any particular coin should be? 2/3/19 1:19:19 AM.025  [ManagedMiner#2 - ] Couldn't reattach. 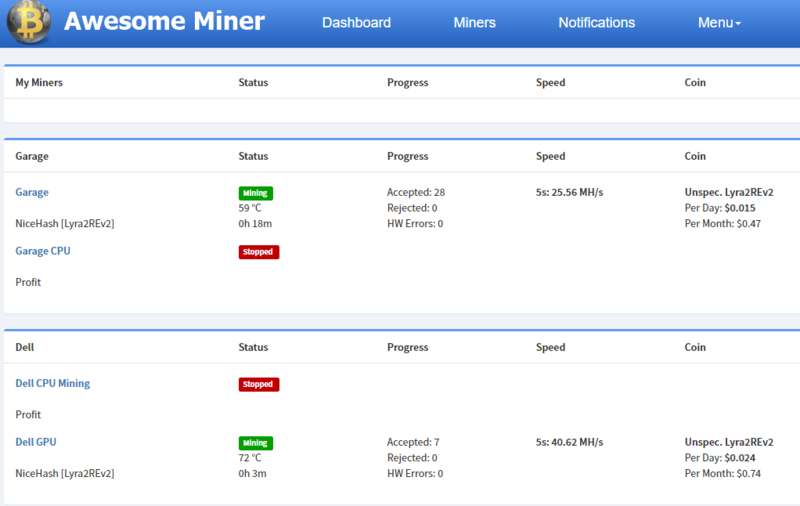 2/3/19 1:19:19 AM.269  [ManagedMiner#3 - My Profit Miner] Couldn't reattach. 2/3/19 1:19:24 AM.087  StartInfo Arguments: -dmS awesome0001 "/home/tonis/.config/AwesomeMinerService/bminer-v14.1.0-373029c-amd64.tar_1/bminer-v14.1.0-373029c/awesome-start.sh"
Did you use the Diagnostics feature in Awesome Miner to compare the command line, to ensure that it was identical, including the "--intensity 18" parameter that looks quite important here? You can share the exact command line via PM if needed. Clones of existing mining software with support for a single algorithm has typically lower priority for being included in Awesome Miner, as they typically can be added manually like you did. Good point! Maybe a right click menu where you can go to the coin on the Coins tab? I'm also planning to show the exchange name on the Coins tab when running it in compact list mode. When you calculate the number of coins per day for a given hashrate, there are many parameters taken into consideration like difficulty, block reward and also this exponential factor. It's simply a number that is unique for each coin, although the value is 32 for most algorithms and the value 0 is also common. I don't know the number for each coin, but for all popular algorithms I enter predefined values in Awesome Miner based on my findings when I try the calculations on WhatToMine, CoinCalculators and so on. If you add a new coin in Awesome Miner, the default value will be 32. In case the calculations are wrong due to another exp. factor is required - you can play around with this factor until the calculations show up correctly. Yes, this will be added. Thanks! Yes, it is identical. The problem is AM always use a config-file. And whenever a config-file is loaded (seems no matter whats inside, maybe still buggy or whatever), the hashrate is increadible low. Without the config-file, so just with the command-line, its perfect. Is there any way to tell AM not using a config-file, but with full compatibility mode? I know that reading them can cause coins to be lost for a few minutes. I talk to you about days, XGAC disappeared days ago. I have the option activated so that the coins that appear are not deleted. And I have not ignored them in options> coins. All this I know, it's very basic. In other currencies I have changed the price and they have not disappeared, but these coins do not exist in my AW, they left. I do not see ZERO, XGAC and the other of X16rt, some for changing the Exchange and others for changing the exponential value, or for the price. And it has only happened to me in these, as I have said in others it has not happened to me. I know this is very strange, I know, but I have to say it in case someone else happens the same. theres a solo mining option on zergpool now can we get an option to specify m=solo in password field for it? Can anyone help with the apparent really poor performance I am seeing, as the screenshot shows? Dell is a dual GPU system with nVidia 1060Ti and 1050, Garage has a single 1060Ti. I'm running 6.1.10 of Awesome Miner, switching interval is set to 3 mins with a 15% switch threshold. I have Enable Managed Profit Switching ticked with providers as Nicehash, Mining Pool Hub, AHashPool and Blazepool. is it 1060 Ti a typo? In this case I think the best way is to use the Device Profile concept (see the Options dialog, Device Profile section). You can define a profile with Intensity set to 18 for example. In your miner (or pool) you can then select this device profile. The result should be that the Intensity parameter is part of the configuration file. Thanks for the report. I will take a look and keep an eye on this. For the coin Zero I know that Awesome Miner for a period of time incorrectly considered the short name to be ZERO when it should have been ZER. Since a while ago it should however show up correctly as ZER.